So, Mardi Gras is upon us and you’ve already bought your plane ticket and booked your accommodations. But, do you think you’ve done enough to prepare for the mayhem? 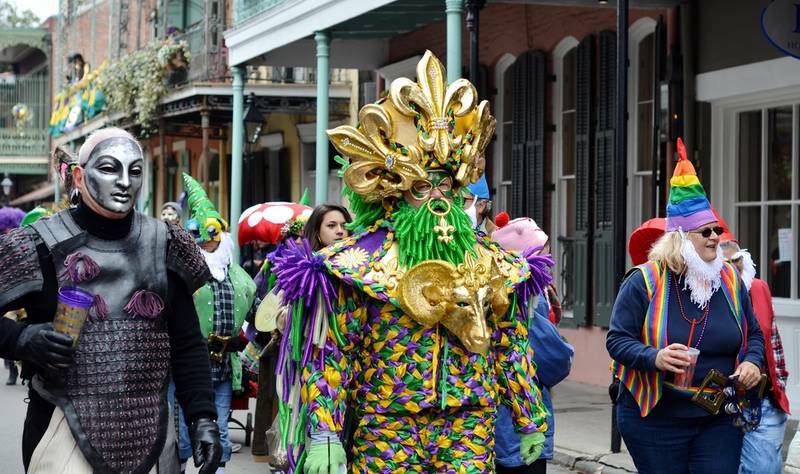 There’s a whole lot more to Mardi Gras than simply showing up. You need a good plan in place, the right gear, and the adaptability to cope with countless unpredictable situations. 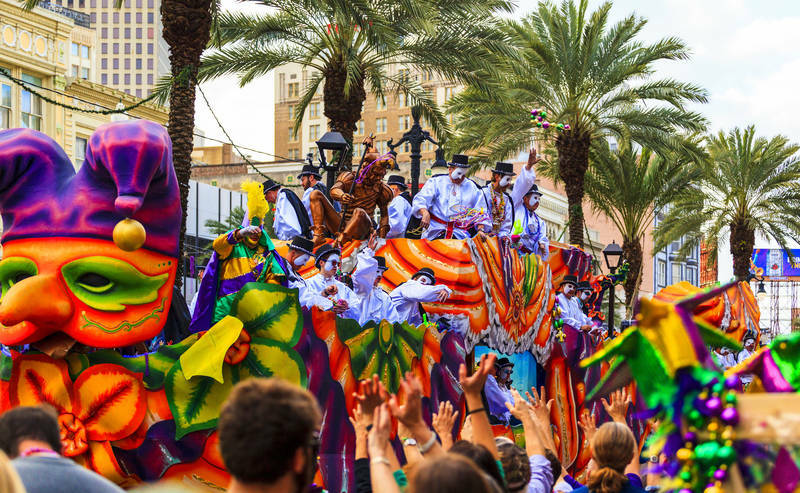 Unless you’re sure that you can handle anything Mardi Gras throws at you, take a look at our list of the top 5 best things to do during Mardi Gras. Every year at Mardi Gras, you’ll find a smattering of people who forgot to dress up. Amidst all of the crazy costumes, zany face paint, and outlandish accessories, these poor folks stick out like a sore thumb…and they know it! You’ll never have felt so plain in your life if you show up to the biggest party in America wearing a t-shirt and jeans. So look, you don’t have to dress like a voodoo queen or one of her mind-controlled zombies just because New Orleans is America’s Spookiest City; but, you should wear something colorful, funky, and fun. You’ll feel more comfortable if you abide by this first entry on our list of The Top 5 Best Things To Do During Mardi Gras. 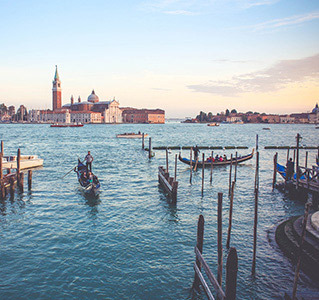 Everyone knows that Mardi Gras and the French Quarter go hand-in-hand. And, just about everyone should spend a significant amount of time partying on Bourbon Street. 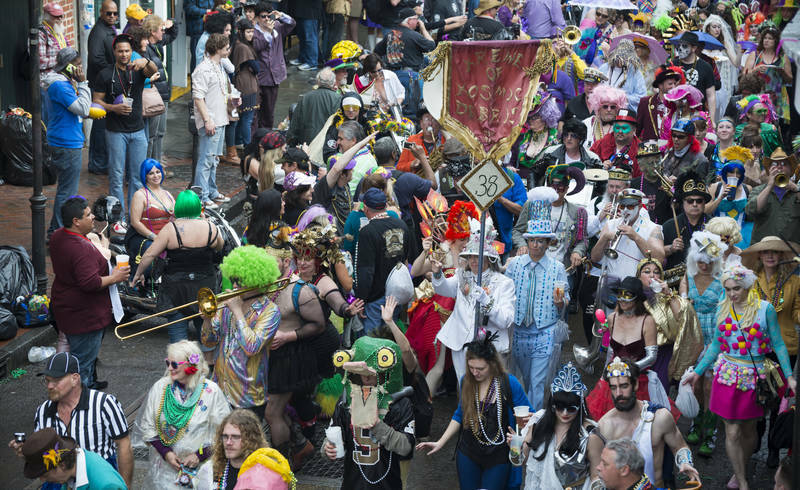 But, unless you want to rub elbows and bump shoulders with mostly tourists during your entire visit, you might want to check out how the locals celebrate Mardi Gras in other parts of New Orleans. You can get an authentic taste of the city simply by heading uptown and watching a parade. And, unless you’re on a New Orleans cocktail tour, you’re far less likely to have a drink spilled on you, too! 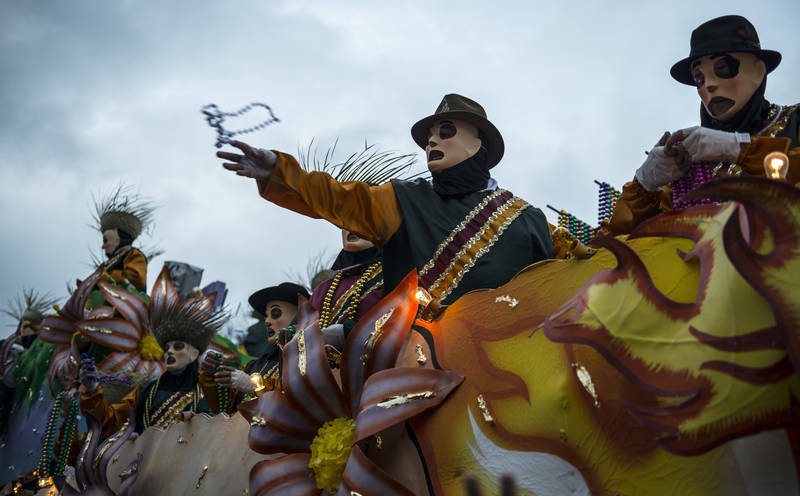 And, speaking of parades, you’d have to live as a total recluse to avoid seeing one during Mardi Gras. 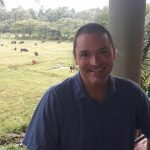 As mentioned above, scoping out a spot to watch a parade in some of the quieter neighborhoods serves as an opportunity to get some of that local flavor. You’ll enjoy better views, less crowds, and a far better chance at catching a “throw” from one of the floats. Then again, there’s something to be said about the chaos that ensues when a parade enters the already crowded French Quarter. It resembles a drunken traffic jam with minimal road rage. One of the iconic symbols of Mardi Gras comes in the form of a humble string of plastic beads. You’ll find a number of ways to procure some for yourself. You can buy them, trade them, or catch them as paraders throw them from a float. But, beyond your standard beads, the most coveted Mardi Gras souvenirs come in the form of other “throws”. You’ve got the highly decorated shoes thrown by the Muses krewe, the golden coconuts thrown by the Krewe of Zulu, and cute little purses from the Krewe of NYX. Getting your hands on one of these will make you the envy of all Mardi Gras revelers. The king cake represents the unofficial food of Mardi Gras because true blue New Orleanians only eat it during the Carnival season. Originally created to celebrate the Epiphany, the king cake is now a “must-try” local food during Mardi Gras. You’ll find it in a variety of forms; but, usually, it’s made with dough similar to that of a cinnamon roll and is covered with either frosting or sugar. 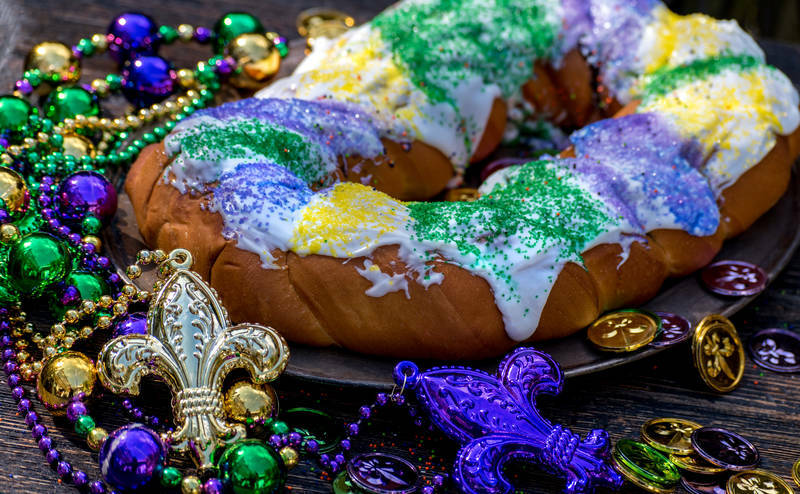 Most times, the king cake bears the colors of Mardi Gras: Green, yellow, and purple. You’ll almost certainly encounter one if you take a New Orleans cultural grand tour around this time. So, don’t leave town without taking a bite. Hey there! 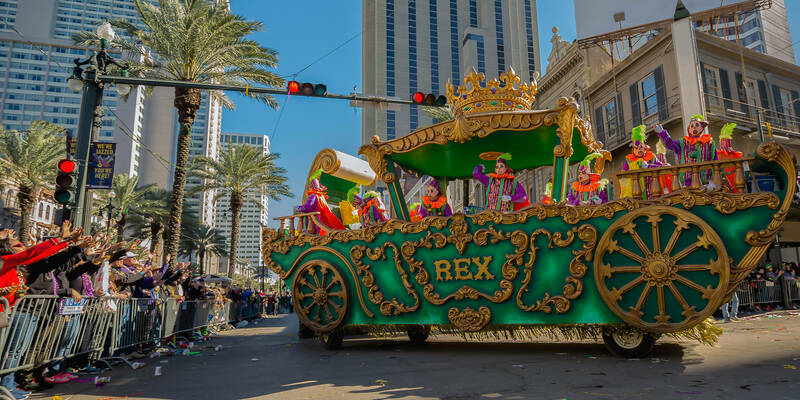 What’s one of your favorite things to do during Mardi Gras? Let us know in the comments and we’ll add it to the list during our next update.